Confocal immunofluorescent analysis of COLO 205 cells (left, positive) and A-204 cells (right, negative) using HNF1α (E3H9V) Rabbit mAb (IF Specific) (green). Actin filaments were labeled with DyLight™ 554 Phalloidin #13054 (red). 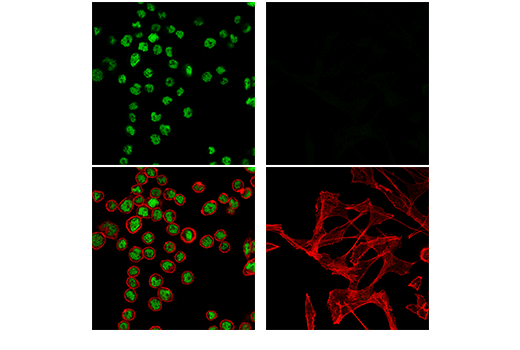 HNF1α (E3H9V) Rabbit mAb (IF Specific) recognizes endogenous levels of total HNF1α protein. This antibody does not cross-react with HNF1β protein. Monoclonal antibody is produced by immunizing animals with a synthetic peptide corresponding to residues surrounding Ala298 of human HNF1α protein. Hepatocyte nuclear factor 1α (HNF1α, also known as TCF1 or MODY3) is a transcription factor that plays a role in the tissue-specific regulation of liver gene expression (1). Research has shown that heterogeneous mutations of HNF1α are linked to maturity onset diabetes of the young (MODY) (2). Recent studies indicate that increased concentrations of free fatty acids can reduce the expression of FoxA2/HNF3β and HNF1α in pancreatic β-cells and lead to their nuclear exclusion, resulting in symptoms of several metabolic syndromes (3). Yamagata, K. et al. (1996) Nature 384, 455-8. Lehto, M. et al. (1997) J Clin Invest 99, 582-91. Ohtsubo, K. et al. (2011) Nat Med 17, 1067-75.